This manual wheel charger is a heavy-duty model which is ideal for big fleet operations and industrial use. It is perfect for situations which need a lot of power including diesel engines. The very high output engine start assists batteries in cranking most engines under severe weather conditions. 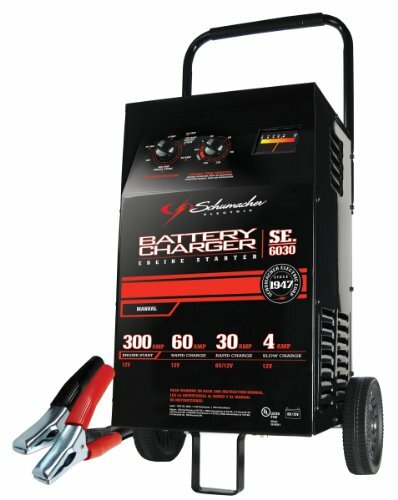 It is ideal for 6 and 12-volt batteries and its 300-amps help engines for emergency starting. It has a 60-amp fast charge which helps to charge a battery in 1-3 hours and a 4 amp slow charge which charges a small 12V battery in 1-5 hrs. It is equipped with a cooling fan for high-performance and long life.